Mango sandesh recipe has been lying in my drafts since the past four weeks. 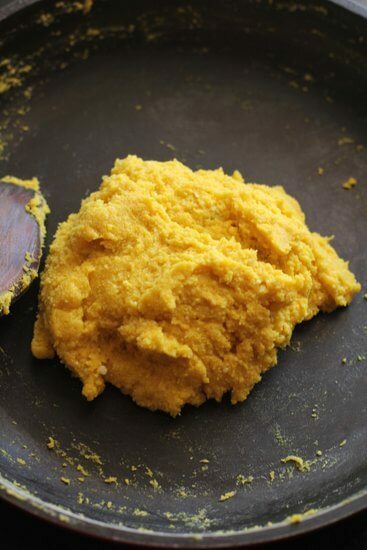 🙂 I am back from my break with a delicious, melt in the mouth, classic Bengali dessert that has the infusion of two of my favorite ingredients, chenna and ripe mango pulp. I have used homegrown mango pulp that worked excellently for mango sandesh. Sandesh is a sweet prepared with freshly made chenna aka moist paneer, powdered sugar and cardamom. It is offered to Goddess Durga during navratri festival celebrations as well as other festive or special events. In fact, in most Bengali homes, no celebration is complete without sandesh. 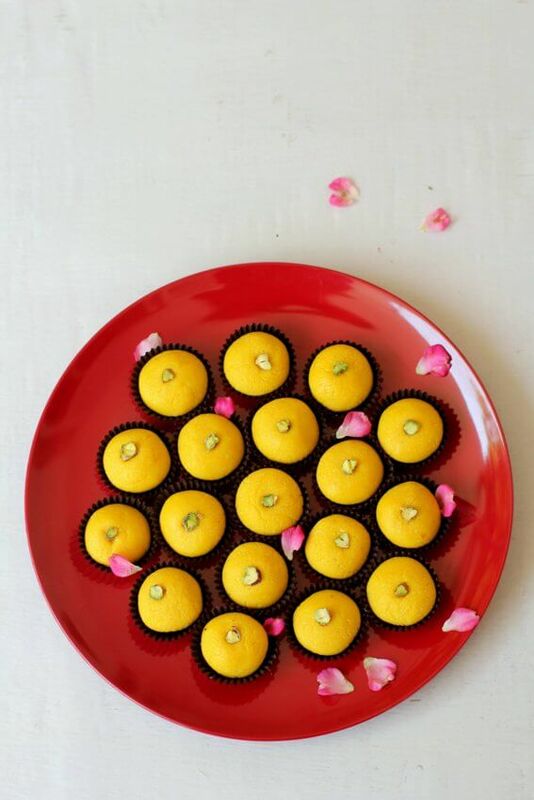 You can make a number of variations with the basic sandesh recipe by flavoring it with rose, strawberry, pineapple, saffron, cocoa powder (chocolate sandesh) and mango puree during the summer months. There are a variety of moulds with which one can shape the sandesh and decorate it with nuts like pistachios, almonds and cashew nuts. Recipe of mango sandesh (also known as aam sondesh) is easy to make though slightly time-consuming but worth the effort. 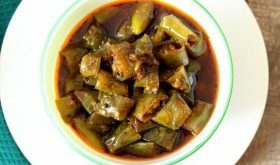 It has a beautiful yellow shade and a wonderful melt in the mouth texture and an addictive flavor. To make mango sandesh recipe, you need to make the basic sandesh. For that you need to make fresh chenna or moist paneer from scratch. I have already blogged how to make paneer. 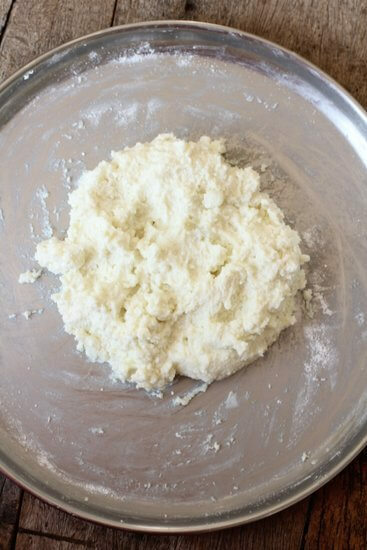 Please follow this paneer recipe post (till step 7) to make fresh chenna (moist paneer mixture). Once the whey is drained, take the residue chenna and tie it in a muslin cloth for the whey to drain completely. This could take at least 30 to 45 mins. You will have chenna ready to make sandesh. Follow the below step by step procedure to make mango sandesh recipe. Take the moist chenna in a wide plate or vessel and knead it with your fingers and palm till smooth and soft. You should be able to form a smooth ball with the mixture. This could take at least 8-10 mins. To this kneaded mixture, add powdered sugar and cardamom powder and mix well. Mix to combine well. It will be a messy mixture so do not panic. 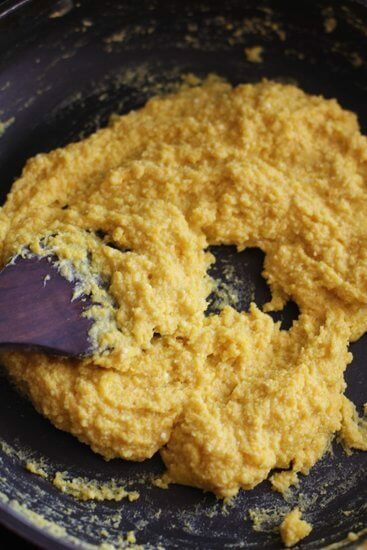 Heat a wide pan on low flame, add the chenna-sugar mixture along with mango puree and mix to combine well. Cook the mixture on low flame stirring constantly. We are trying to remove the moisture in the chenna-mango mixture by cooking it on low flame. You have to be patient as this could take anywhere between 12-15 mins. Once the mixture turns dry i.e it should have a very soft, dough-like consistency. Turn off heat and remove it onto a greased plate or thali. 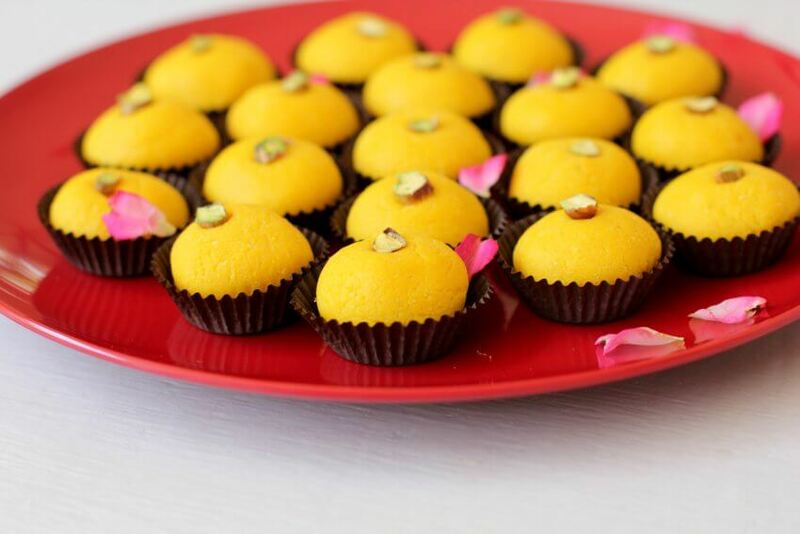 Allow the mixture to cool slightly so that you can shape the mango sandesh into smooth balls using your hand. Shape into small lemon sized balls and flatten lightly. Place chopped nuts of your choice or a whole pistachio in the center. Alternately, you can make a small dent in the center and place mango puree in it. You can serve it at room temperature or place in the fridge for a few minutes and serve chilled. Do give this delectable mango dessert a try. Definitely a gem among mango recipes and Bengali recipes. Heat 2 litres milk in a heavy bottomed vessel and bring to a boil. 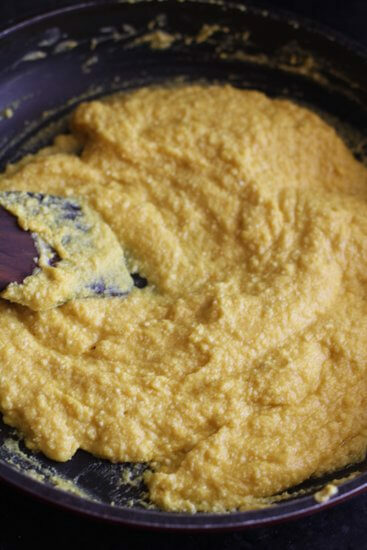 Reduce heat to low and very slowly add whisked curd and keep stirring continuously. The milk will begin to curdle and milk solids start forming along with a thin liquid called whey. 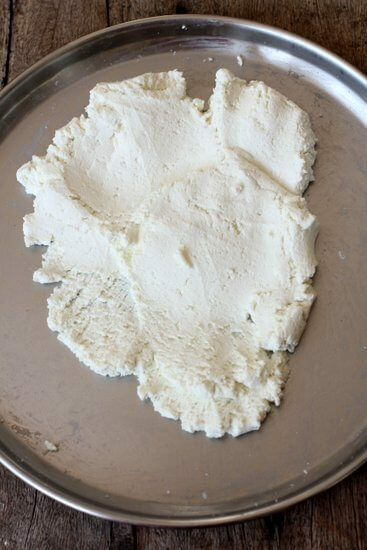 If the milk is not curdling after adding the entire curd, add 1-2 tbsps of curd to curdle it. Turn off heat. Immediately add 10 ice cubes to the vessel to stop further cooking of milk solids. Allow to rest for 5 mins. Take an empty vessel and place a sieve over it. Cover the sieve with a wet muslin or cheese cloth and pour the curdled milk into it. The whey will collect the bottom of the vessel and the curdled milk solids (called chenna) will remain on the top. Set aside the collected whey that can be used to knead chapati dough. Pour 2 to 3 cups of water over the chenna to wash off any sourness that it might have. Bring the edges of the cloth on all four corners and gently squeeze the milk solids (chenna) once or twice so that excess liquid is removed. Tie a knot so that you can hang it at a height for the excess liquid to drain. Set it aside for at least 45 mins. You will have moist paneer or chenna ready to make sandesh. 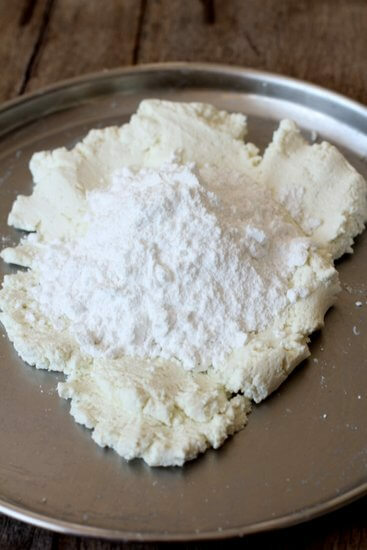 Place the chenna on a wide plate and knead it gently for at least 8-10 mins till it forms a smooth mixture. Add powdered sugar and cardamom powder and mix well to combine. Heat a non-stick pan, add chenna-powdered sugar mixture and cook on very low flame stirring constantly. Since we have added sugar, it will become a soft gooey mixture. Continue to cook on low heat till the mixture leaves the sides of the pan. It will become a soft lumpy, dough like mixture. Turn off heat and place the mixture on a greased plate. Allow to cool slightly so that you can handle the mixture with your hand. Knead the mango mixture lightly for a minute and make small lemon sized balls. Flatten them slightly and make a small dent in the center and place crushed nuts or a whole pistachio. You can refrigerate for a few mins and serve chilled or at room temperature. Once the mixture leaves the sides of the pan and becomes lumpy turn off the heat. If you allow the mixture to continue to cook at this stage, it will become hard and rubbery. You can use moulds to shape the mango sandesh. Lightly grease the moulds with ghee or clarified butter. Add some crushed nuts in the center of the mould. Place warm mango sandesh mixture in the mould and press it. 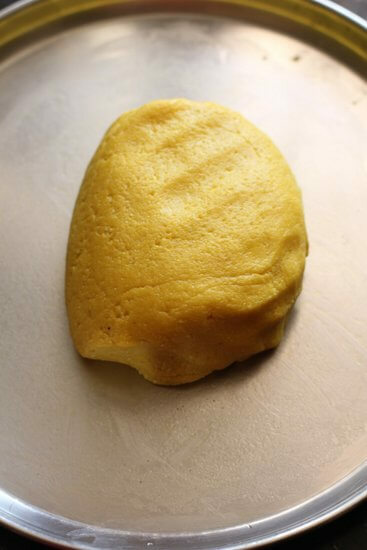 Gently unmold and remove the shaped mango sandesh. 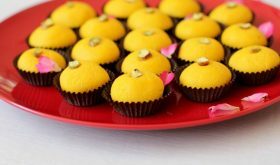 You can store the mango sandesh in an air tight container and place at room temperature for two days and in the fridge for 4 to 5 days. 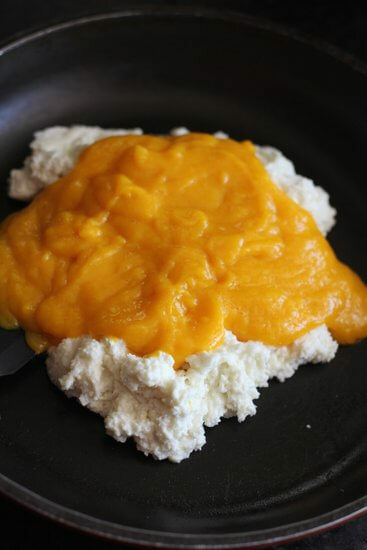 Any sweet ripe mango that has a smooth textured puree when blended works fine. By Sailu Published: June 6, 2016 Mango sandesh recipe, a tasty, easy Indian sweet made with chenna, mango puree & sugar. 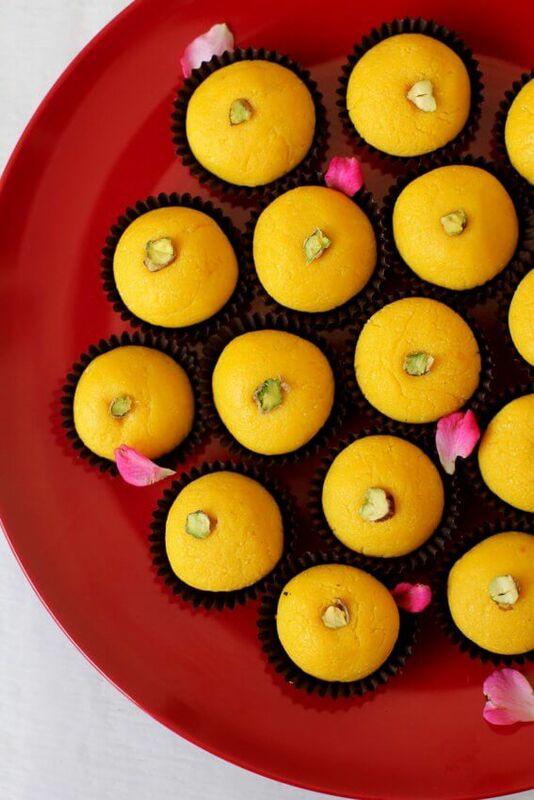 How to make mango sandesh, a gem among bengali recipes. Thanks for sharing details specially Ingredients and methods also we got same method from Veeba food services. Its provides recipe methods also.